"Ashibumi and Yazuka" from the August 2014 edition of the Kyudo Magazine by Iijima hanshi translated by Howard Houng | The Kyudo Project Blog! 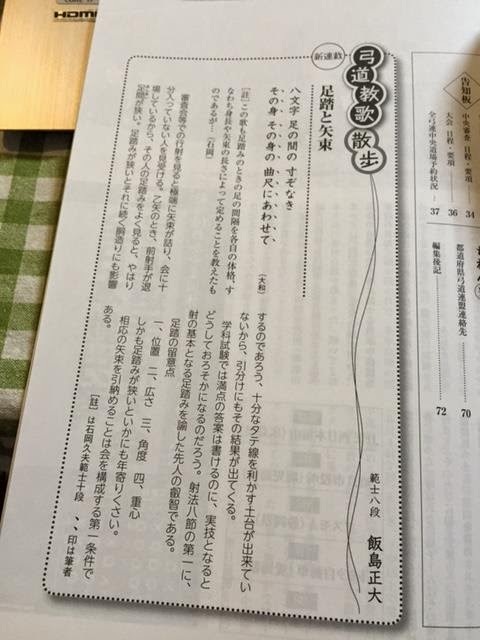 So yesterday I shared an article by Iijima-sensei taken from a new section in the Kyudo Magazine that started from August called 弓道教歌散歩 Kyudo Kyoka Sanpo "A Stroll through Kyudo Teachings (Poems)" Iijima-sensei introduces us to different Kyudo Poems to illustrate different aspects in Kyudo. This article is from the August edition titled "Ashibumi and Yazuka"
Hachimonji ashi no ma no sun zonaki, so no mi, so no mi no kanejaku ni awasete. When watching people in their Shinsa, most of the time many people's "yazuka are stuck" and not really getting into kai. When looking at their ashibumi, he notices that it is too narrow. Having a narrow ashibumi affects the dozukuri and the tate-sen (vertical line) is not strong enough, so it produces the above outcome. It seems that most people receive full points when writing about this on the written test, but when it comes to the shooting test, most people don't do it correctly. The first step in the Shaho-Hassetsu is the ashibumi, which is the basis of the Sha; wisdom from our predecessors. Having a narrow ashibumi makes you look "old". Being able to establish the length of your yazuka is the first condition needed in order to construct Kai.